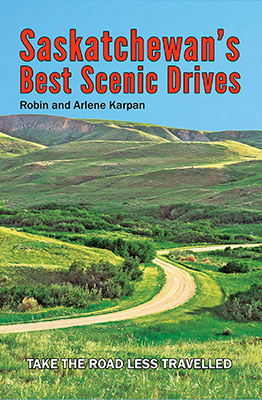 Parkland Publishing book: Saskatchewan Best Scenic Drives by Robin and Arlene Karpan of Saskatchewan, Canada. Saskatchewan is tailor-made for backroad exploring. We have more roads than any province in Canada—enough to circle the equator four times. Possibilities are mind-boggling, from drives through spectacular river valleys to sweeping natural grasslands, lake-studded boreal forest, wild badlands, some of Canada’s largest sand dunes, breathtaking viewpoints, little-known hideaways, and historic treasures. Drive a third of the way across Saskatchewan entirely in the Qu'Appelle Valley. Take a little-known backroad through the Big Muddy Badlands. Wander through the Thickwood Hills to the other-worldly "Crooked Trees". Combine your drive with awesome hikes and nature walks to discover the best that Saskatchewan has to offer. Precise directions, GPS coordinates, and maps make it easy to discover these and many more Saskatchewan scenic wonders. Saskatchewan's Best Scenic Drives is available for $24.95 at better bookstores, gift shops and outdoor stores, or direct from Parkland Publishing. Printed on FSC paper stock. All text and images on this site are © Robin and Arlene Karpan. All rights reserved.